Using QTouch® Analyzer you will monitor the touch delta of a sensor and adjust its detect threshold. This tutorial builds on the Intro to PTC and Analyze Touch Data Using QTouch® Analyzer projects. Make sure you've completed those before continuing with this hands-on exercise. Perform steps 1 through 7 from the Analyze Touch Data Using QTouch® Analyzer project. Select Tabular View and touch the 'V' in the AVR symbol (shown below) on your ATmega328PB Xplained Mini. Observe the maximum Delta shown in the Tabular View. In the QTouch Analyzer window, click on Stop Reading. 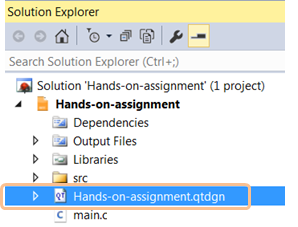 In the Solution Explorer window, double-click on the .qtdgn file. Note that you may have named your project differently. Select 'Button0' and click on the Settings icon. In the 'Button0' settings, set detect threshold to 75. 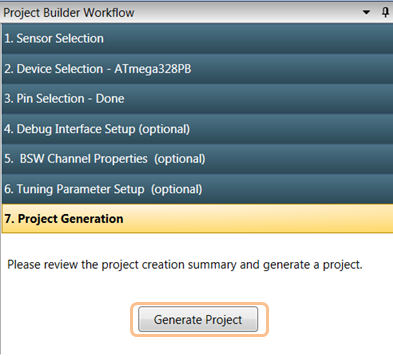 Go to the 'Project Generation' section and click Generate Project. Program the application by clicking on the Start Without Debugging icon. In the QTouch Analyzer window, click ReConnect. 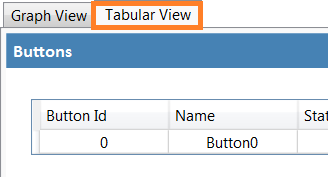 Use the 'Tabular View' to observe touch delta and state. Touch the sensor lightly (so that Delta is less than 75). You will notice that State is OFF. Touch State will only change to ON whenever the Delta of Button0 is more than 75. Detect threshold can be directly modified inside the touch_selfcap_sensor_config() function of the respective sensor in the touch.c file. You have learned how to configure and set the detect threshold value of a sensor.